Explore rhythm, notation, technique, and musicianship! Use this thorough and balanced exploration to fine tune your timing and sight reading abilities. The practical approach used is aimed at both beginners and advanced players. You are bidding on 3 brand new books (books 1, 2, and 3) direct from the author Mike Prestwood. These books use a fast paced and thorough method system that covers how to read music, grip, technique, how to build chops, sight reading, timing, meter, and musicianship. Each lesson explores rhythm and various aspects of drumming. The best system for learning or maintaining your ability to sight read, build chops, and great timing. Explore rhythm, notation, technique, and musicianship! Volume 1 is the ideal teaching tool to help prepare beginning players for all styles of snare drum and percussion performance! Volume 1 uses orchestral snare as a precursor to playing drums. Volume 2 is intended for intermediate and advanced players and completes the exploration of rhythms found commonly in music. Use volumes 1 & 2 to fine tune and maintain your timing. Volume 3 explores advanced rhythms and concepts that most drummers never explore including duplets, quadruplets, quintuplets, septuplets, alternative notation, flat flams, polyrhythms, switching beat duration, rhythmic mnemonics, advanced time signatures, mixed rhythm accent patterns, and more. Advanced players and professionals will find the fast-paced and complete exploration of their craft valuable during their entire career. Use these lessons to maintain your chops, timing, and sight-reading abilities and to fill in holes in your education. Each lesson is as complete as possible and as independent from the other lessons as reasonable. You will find yourself returning to various lessons over and over throughout your career. You will find many of the lessons to be excellent reference sources including such lessons as repeats, dynamics, tempo, etc. that cover the topic completely. Professionals can use this series to fine tune their timing and sight reading abilities and to fill in holes in their education. You can improve your playing by practicing a few exercises from these three books daily. Download and play each lesson along with the the MP3 audio files. Nearly every lesson has play along audio files available at various tempos that are suitable for the denseness of the rhythms. 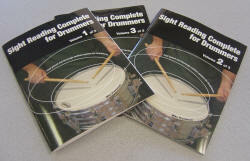 You are bidding on volume 1 of Sight Reading Complete for Drummers direct from the author Mike Prestwood. Volume 1 is the ideal learning tool to help you prepare for all styles of drumming. It uses orchestral snare as a precursor to playing drum set, rudimental snare, timbales, or any other percussion instrument that uses drumsticks. It covers the basics of drumming including how to read music, grip, technique, how to build chops, sight reading, timing, meter, and musicianship. Each lesson explores rhythm and various aspects of drumming. The best system for learning drums for a lifetime of enjoyment.